Mutant Elfin is variation of Elfin that is a human/frog hybrid. 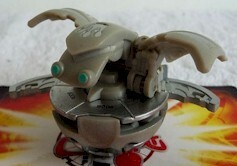 It is similar in the base of its ball form as Neo Dragonoid. This Bakugan will be part of the Special Attack Series. Its special attack feature will be a horizontal attribute changing wheel, with a small plastic needle that will most likely indicate the attribute it uses for the battle. Purchase your Mutant Elfin Bakugan from Amazon now!